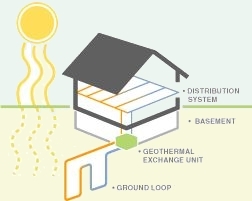 Many homeowners are enjoying a high level of comfort and significantly reducing their energy use today with GeoExchange (geothermal) heating and cooling systems. This marvelous technology relies primarily on the Earth’s natural thermal energy, a renewable resource, to heat or cool a house or multi-family dwelling. The only additional energy GeoExchange systems require is the small amount of electricity they employ to concentrate what Mother Nature provides and then to circulate high-quality heating and cooling throughout the home. However, there are not many HVAC Professionals with the training and expertise to service or install these systems in our Eastern Pennsylvania area. But A&S HVAC can help. Give us a call for more information on our geothermal expertise.